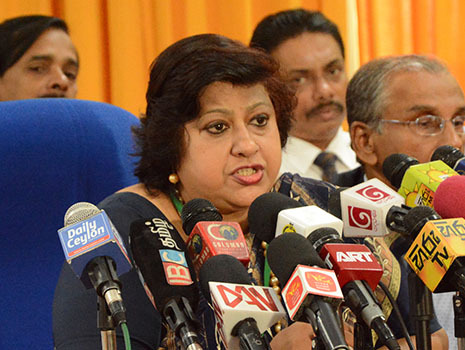 Media had reported that the Director General, the Chairman and Commissioners of Commission to Investigate Allegations of Bribery or Corruption were contemplating of resigning in response to the statement made by President Maithripala Sirisena on the 12th. However, it is learnt now that the Director General has changed her decision. The sources say once she comes back from her foreign tour she would reveal to the media regarding her decision. Various individuals, organizations against bribe taking, frauds and corruption, her associates as well as politicians of the government as well as the opposition have requested her not to resign. Many in the sector too have told her that her presence in the Commission was essential as there are many issues that need to be completed and the work that have been started should be completed as there are many who believe that she could do the job honestly and efficiently. As such, it is said that she had changed her decision to resign from the post. However, the Chairman of the Commission might resign from his post say sources.